For the last 5 years, we have posted countless articles covering both natural disasters and their impact on our food supplies as well as on many other timely topics. After several decades of monitoring these events, it's hard to convey how shocked we are by the sheer number of disasters that have occurred just in the first 4 months of 2011. The DHS/FEMA maps were defined by 2 colors: blue signified no disasters (to distinguish the disaster-free areas from water, they are shown in white below) and yellow indicated declared disasters. 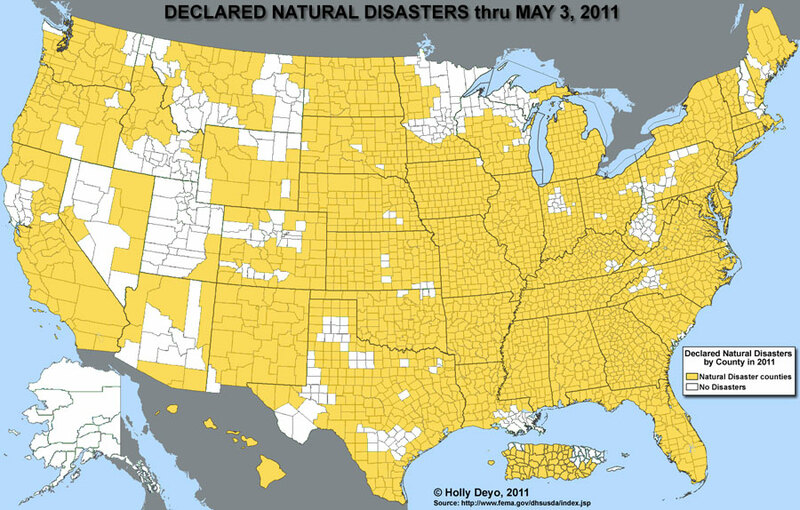 Map after map, state after state were mostly yellow. Surely this must be an error? Thinking through the numerous news items on Earth Changes, with sinking feeling, I knew they were correct. It was only when the state information was transferred to a single national map, the implications become uncomfortably clear. Notice how many disasters have occurred in food-producing areas. They are striking the heart of our food growing regions. Many food crops have been wiped out by drought, flood, hail and freezes. These food destroyers are occurring in greater frequency and having larger impact. America's food belts are taking mighty hits. Some growing areas will not recover this entire year. It won't matter if you don't have work, can't trade greenbacks for gold, have no access to Facebook or on-line shopping or whatever else you care to name - minus faith in God  if you don't have clean water and food, civilization will quickly disintegrate around you. In the 2007-2008 food riots across the globe, we witnessed a mere taste of what to expect. The only difference is that WE, Americans and Canadians, enjoyed these precious commodities of bread, wheat, soybeans, corn  the staples of food supplies  without interruption. Countries that suffered natural disasters combined with economic catastrophe were either too poor to import these necessities or there was none to be had. America is one of THE largest food exporters. Now supplies in our country are getting creamed with one weather event after another. Crops are either hammered by drought or literally inundated by FEET of water. Some farmers still can't get their crops in the ground because the land is too soggy - never mind the 3 MILLION acres that are now submerged due to the unending, unmerciful rain and flooding in the Midwest. Still there is no let-up in sight. Many farmers' crops are wiped for this entire year. There will be no second shot at planting. 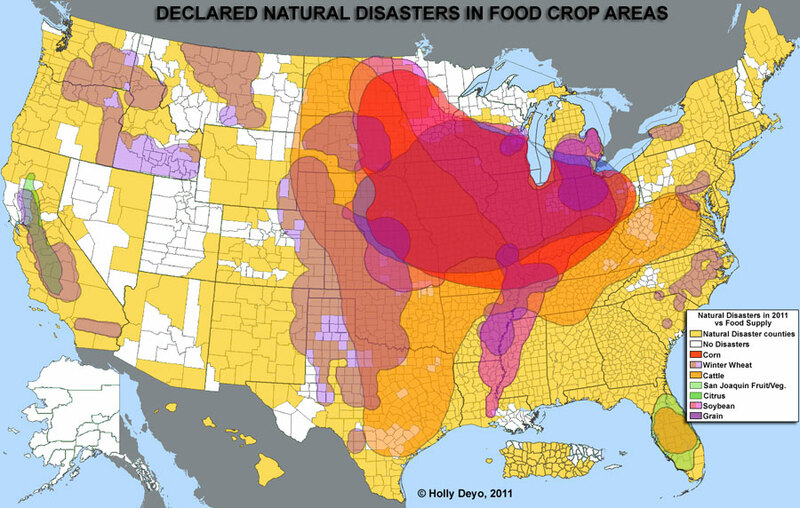 Now look at the food growing areas laid over the disasters. 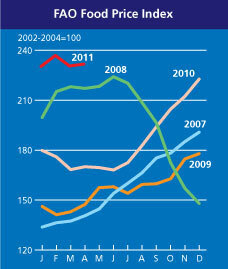 There is hardly any crop region that hasn't experienced a natural disaster in 2011. It paints a very unsettling picture. Unprecedented freezes took a lot of Mexico's produce that supplies huge quantities of fresh fruits and veggies to North America. On a lesser scale, late spring freezes have wiped out Colorado's apricots and California also took a hit on their produce. Conversely, Texas, one of the backbone states for cattle, is experiencing the worst drought in decades forcing ranchers to sell herds early. In the short term, this will plummet the cost of beef, but next year, when cattlemen try to replenish herds, prices will be at a premium and you, the consumer, will see these huge price increases at the butcher. Last year in Australia, another huge food producer, was struck with massive rains. These floods crippled food supplies. Today, conditions are reversed. Drought rears its head again. Corn planting in the U.S., the world’s largest grower, is advancing at half of last year’s pace because of excess rain, government data show. The Canadian Wheat Board said fields are so muddy that only 3 percent of grain has been sown, compared with 40 percent normally. At the same time, drought left the Kansas wheat crop in the worst shape since 1996, and dry spells are threatening crops in France, Western Australia and China. The U.S. winter-wheat harvest, which begins next month, probably will total 1.387 billion bushels, the least in five years, according to the survey. The crop in Kansas, the biggest U.S. grower of winter varieties, may shrink by 29 percent from last year because of drought, according to a survey of 55 analysts conducted last week by the Wheat Quality Council and based on field samples. The dry spell in Texas, the No. 2 grower of winter wheat last year, means the state may produce two-thirds less than normal, said Mark Welch, an extension economist at Texas A&M University in College Station. Central Kansas had less than 25 percent of normal rainfall in the past 30 days, while parts of Oklahoma and Texas had less than 5 percent, said Drew Lerner, the president of World Weather Inc., an Overland Park, Kansas-based forecaster. In Minnesota and North Dakota, the biggest spring-wheat grower, farmers face planting delays after receiving twice the normal amount of precipitation in the past month, Lerner said. Parts of the Ohio River Valley and the Mississippi River Delta have had up to four times the normal amount of moisture, he said. In a report tomorrow, the U.S. Department of Agriculture probably will cut its forecast of global corn reserves before this year's Northern Hemisphere harvest to 122.5 million metric tons, the lowest in four years, according to a Bloomberg News survey of 14 analysts. The U.S. is the world's biggest exporter of corn, soybeans, wheat and cotton. Dry weather in France and Germany and the U.K.’s hottest April in at least 352 years are threatening crops across the European Union, producer of one-fifth of the world's wheat. Less than a year after the worst drought in a generation destroyed one-third of Russia's wheat crop and sent global food prices surging, more bad weather is damaging fields from North America to Europe to Asia. Parts of Western Australia have had the lowest rainfall on record for the past 16 months, according to the country's Bureau of Meteorology. The government in Manitoba, Canada, has declared a state of emergency because of floods. Wheat output in China, the world's biggest consumer, may decline for a second straight year because of dry conditions, Tommy Xiao, an analyst at Shanghai JC. Intelligence Co., said on May 5. Drought conditions may persist in wheat-growing areas from China, the world's largest grower and consumer, to the U.S. and Western Europe, hurting crops and lifting prices, British Weather Services said on May 6. Global wheat inventories may drop to 182.1 million tons by June 1, down from last month's USDA estimate and 8 percent lower than a year earlier, according to last week's Bloomberg survey. Inventories at the end of next year may be little changed at 182.27 million, analysts said. Whispers of civil unrest are rattling global markets. Look where prices are even now  the highest in nearly a decade and the year is not even half over. This weekend, and for the last several weeks, Stan and I have enlarged our fruit and vegetable gardens doubling them. By using raised beds and biointensive methods as described in Garden Gold where you cram a lot of seeds and seedlings together, you net big yields from little areas. 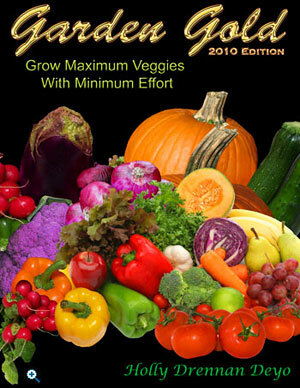 Even people with very limited space can enjoy lush, bountiful veggie gardens. In April friends from Montana had brought us fruit bushes and fruit trees along with non-hybrid herbs and potatoes she's grown for 40 years. We happily incorporated them into our growing gardens appreciating what they will produce. Saturday, as I sweated over chiseling a hole in the crummy dirt here that passes as soil, a neighbor good naturedly joked, Hey, when are you gonna eat that? Yes, the new Redflame and Concord grape bushes were small, but with a little TLC, sun, water and fertilizer, we'll enjoy grapes, jelly and wine in no time. I pounded out another new hole and wondered absently how glib the neighbor will be when food conditions get really tough and he knocks on our door for help. (Let me share that we totally remove the poor quality dirt [read that as 'tan concrete'] and replace it was Garden Gold's Super Soil recipe. It would take several years to amend it properly so it's just easier to ditch the poor dirt and replace it.) Not surprisingly, these neighbors are Wisconsin transplants where water is plentiful and disasters were few. They've had few points of reference. However, things have changed and nearly 3/4 of Wisconsin has already experienced federally declared natural disasters this year. In addition to the existing orchard, fruit-bearing bushes and raised beds, last year we started an asparagus patch. They need a year to establish themselves and then you have a wonderful, vitamin-rich crop that comes up year after year and they beat the socks off grocery store asparagus for tenderness. Two weeks ago for a neighbor who'd had surgery we took her two container-planted tomatoes. They are Italian so naturally we gave them Romas. You should have seen her face light up! Being Brooklyn transplants, Pat never had a garden, but since the tomatoes were in pots they were something she could manage even in her debilitated state. These will give her fresh fragrant TASTY tomatoes, unlike the grocery store trash that fills your belly but not your soul. It will also give her a sense of accomplishment that she can now raise some of her own food and perhaps encourage her to try a real garden. Flowers die, fruit baskets disappear, but these plants she'll enjoy for many months. We also have planted six 5-gallon containers with tomatoes and peppers. They'll live outside till bad weather requires them to come inside. For the first time in years, we'll enjoy wonderful tasting veggies all through winter instead of grocery stores' tasteless offerings. Several months ago, we ordered in a TON of seeds. We purchased both hybrids for this year and non-hybrids for upcoming growing seasons. The extra seeds we'll keep in the freezer to extend to maximum storage life. These are unsettled times and we promise, things will only get more challenging. We are seeing the End of this Age balanced on a banana peel. Permission granted to repost in its entirety with all links and graphics included.